So you just passed Whale level and are now searching for Word Trek Monkey answers. You can use the search form below to find all the answers to Monkey category. Levels are random. You have to enter the first 3 or 4 letters of the top row in the search form. The more letters you enter, the better the result will be. Entering 5 letters will give you the exact answers. 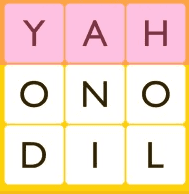 You can enter in the search box the letters YAHO and then pres enter. Of course you can enter just 3 letters, but the results won’t always be perfect. If you finished Word Trek Monkey level, you can go to the next level: Word Trek Orangutan. Or in alternative, you may want to go to the homepage of Word trek answers. The developers added in 3000 words in this game and more than 600 puzzles, so you should definitely consider playing this game if you want a word based gmae with a lot of words in it. The main benefit of playing Word Trek is that it tests your vocabulary and it also helps you challenge your brain as you go along. The puzzle board size will always increase as you play, which makes it cool all the time. It’s exciting that you can ask friends for help because that does offer an immense benefit as you play and you do want such a thing, for sure. To be able to play the category Word Trek Amoeba, you have to download this game. Word Trek is a free game. It is available for both Android and iOS devices. Dowload Word Trek from Google Play and iTunes. Share our page with you friends on Facebook/Twitter! They may need help, too.